Netaji Subhas Institute of Technology (NSIT), New Delhi formerly known as Delhi Institute of Technology (DIT) with its campus at Kashmere Gate, New Delhi is an Institution of Government of NCT of Delhi under the Department of Training and Technical Education and comes formally under the purview of Faculty of Technology, University of Delhi. The present campus is situated at Sector-3, Dwarka, New Delhi - 110 078, India. NSIT is an independent institute and is affiliated to Delhi University. Its admission procedure and syllabus for various B.E courses is like that of the Delhi College of Engineering (D. C. E.), both of which are under instruction of Delhi University, Faculty of Technology. NSIT however conducts its M.Tech and Ph.D programs (under Delhi University) independently and different than those of D C E.
The NSIT campus is located in Dwarka, South West Delhi covering an area of over 150 acres. The campus has buildings for both Administrative and Academic for various departments. 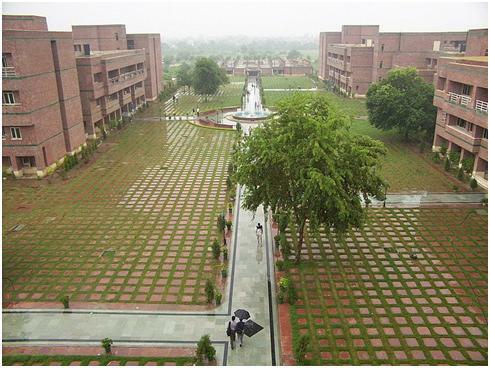 The campus also has three boys' hostels and a girls' hostel. The sports facilities present in the campus include a football ground, a cricket ground, table tennis rooms, gymnasium etc. The Delhi Government in 1997assigned Rs. 762 crores (187 million US$) for its education department and as part of this budget, the government of Delhi has proposed a Science and Technology park at NSIT with the key objective being to 'establish Delhi as the heart of the knowledge industry'. The institute will be set up in alliance with NASSCOM which will include a Nano-technology center. The hostels offers everything from all night gaming parties to intranet via DC++ where one can find all the movies, software and TV series to television with plasma screen. District centre is also just 20 minutes away. The institute’s rank 1 and many toppers were hostlers. Hostlers have the freedom to indulge in projects and can stay till late depending on how the project goes. During exams the hostel is perfect, in the sense that you get all the notes and doubt clearance classes as everybody is there for everybody. Also majority of people organizing all the fests are hostlers as it is quite easy to participate in college activities being a hostler. The best part here again is that two new hostels will be ready in a few months and the work on shopping centre is also ongoing. Resonanz the annual intra-college cultural festival of NSIT is witnessed during odd semester and marks the beginning of the college life for the fresher at the campus. Innovision is the annual technical festival of NSIT, inviting some of the best brains from all over the country and big corporate names, as event organizers as well as sponsors. Students get a chance to showcase their skills in events like Paper presentation, Entrepreneur challenges, Programming Challenges, Linux Quizzes etc. Then there is Moksha a 4-day National cultural extravaganza held at NSIT every even semester, with Hasya-Kavi Sammelan, Qawwali, Choreography, Fashion Show, Pop how and the Rock Show taking the pedestal. It is considered to be the one of the biggest cult fests of New Delhi. The NSIT graduate networks – with over 5000 graduates – are always in hand ready to help you with networking opportunity and career advice. NSIT graduates can be found in every Major Corporation and research house around the globe amongst whom many are highly accomplished in their respective fields, further enhancing the recognition of quality education at NSIT.